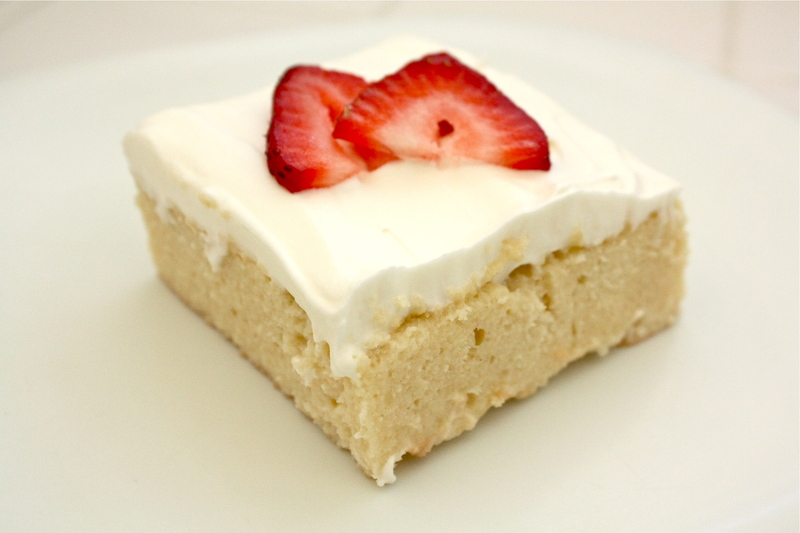 When I was going to school in Minneapolis, my friend Urmila made this amazing cake called tres leches. I swear I died and went to heaven that night. Best cake I’ve ever had, hands down. I’m not a huge cake person, but I would give my right arm for one more piece of that. Urmila runs this awesome YouTube channel now, called Mila Makes, and I asked her to make the tres leches, so I could try to recreate it. She not only made tres leches, she one-upped my request and made quatro leches. Do your thing, girl. Now, as all of you should know, I’m not a great baker. Seriously. My brother and I tried to make a pie without a recipe the other day—just terrible. So going into this dish I was a bit nervous, but after a glass (or bottle) of wine, I was feeling pretty confident. It was fun mixing up the batter and getting messy with the flour. Like, really messy–it was everywhere. I don’t think I’ve fully mastered the hand mixer, yet. I’m definitely a fan of licking the spoon (and the beaters, and the bowl), but as for the final outcome, I’m not so sure my cake stands up to Urmila’s. Mine is definitely a little more dense than I remember her’s being. I blame this in part on my impatience. I don’t think it was quite ready to come out of the oven, but I was definitely ready to move on to the next step, so I pulled her out. Aside from the denseness, the flavors were on point, so I’ll give myself 2.5 out of 5 stars for this dish. Don’t forget to check out Urmila’s rendition and more of her videos, here! Whisk together the flour, baking powder, and salt and set aside. Oil the pan and preheat your oven to 350 degrees. Beat the softened butter until it’s creamy. Add the sugar gradually, then the eggs and vanilla. Finally add the flour mixture in three separate batches. Pour the batter and make an even layer in the bottom of a cake pan. Bake for about 20 minutes or until golden brown (make sure you wait until it’s golden brown, this is the part I messed up by pulling it out before it was ready). Let cool for about 30 minutes. Stir together the evaporated milk, condensed milk, and half-and-half for your glaze. Once cooled, poke a ton of holes in your cake (EXACTLY ONE TON). I used chopsticks to do this. Pour the glaze over your cake and let it soak in for 5 minutes. Cover with saran wrap and let sit in the fridge for 8 hours. Make the topping by beating the heavy cream, sugar and vanilla. Spread over the top of your cake and then devour that shhhhh. *WARNING: This dish is extremely unhealthy.